Marine insurance is a key consideration when shipping overseas. Whites Moving & Storage are proud of the international removals service we provide our customers and we always try to minimise problems during the moving process. However, it pays to be aware that your possessions are exposed to several inherent risks which are outside our control while your goods are in transit and/or storage. We recommend that you consider protecting your valuable personal possessions while in transit and/or storage with our “All Risk” Marine Standard Liability cover. Marine Insurance Cover is offered to you on receipt of a completed Overseas Valuation Form. Such Marine Insurance Cover is ‘Comprehensive’ and ‘All Risk’ and is based on the values as declared by you on the Overseas Valuation Form. There are certain exclusions as detailed within our Terms and Conditions. If you have owner-packed possessions, or do not provide us with a declaration of value, or if you do not require us to accept Marine Insurance, then our liability to you will be a maximum of £40 per item if anything is lost or damaged because of negligence or breach of contract on our part. Please see our Terms & Conditions for full information. The perils of international transport are varied. 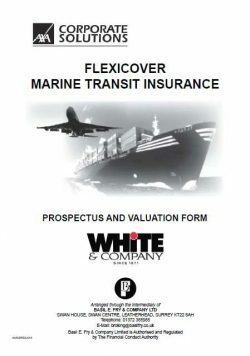 Good insurance is therefore essential and with the Flexicover Scheme held by White & Co. Plc. and underwritten by AXA Corporate Solutions Assurance, a leading insurer, you are assured of first class cover. The cover is on an All Risks basis, subject to the terms and conditions detailed on the final page of the proposal. The “Standard Cover” is subject to a Claims Excess representing 1% of the Declared Value under the Certificate of Insurance subject to a minimum of £25 and a maximum of £250. “Super Cover” is as per Standard Cover without a Claims Excess. “Restricted Cover” which is total loss only is also available – please refer to White & Co. for appropriate charges if this cover is required. It is most important that you cover your effects adequately. We suggest that before completing the form you familiarise yourself with the terms and conditions of cover on the final page of this prospectus. 1. Make sure that all items you require to be covered are listed on the valuation form. You will see that for certain items, mainly furniture, the form is divided on a room by room basis. This is to help you remember all the effects in your consignment but is intended as a guide only. Therefore, if for example you have more than one television they can all be covered with the T.V. category under the Living Room section as long as you allow for the correct total number and value. 2. Any effects you fail to list will not be covered. If there is insufficient room on this form either provide a supplementary list or ask White & Co. for a second valuation. If you do complete more than one ensure that the first form is marked “1 of 2” and the second “2 of 2” or as appropriate. You will see that there are a number of blank spaces on the form to enable you to insert your own category descriptions under the relevant section. 3. Make sure you value your effects correctly. You should ascertain the replacement cost at destination in like condition and age as the cover is on an indemnity basis. Prices may vary considerably from the U.K. and we suggest you consult White & Co. or the appropriate embassy for guide-lines. If the value you indicate is not sufficient any claim will be subject to “average”. This means that if you cover an item for £100 and it is found to be worth £200 at your destination then only 50% of any claim you make for the item will be met. 4. In the event of the total loss of your consignment you will have been put to the expense of shipping your goods to no avail. If you insert the cost of the Shipping and Packing costs in the appropriate section of the valuation form these costs will be met by the cover following a total loss. 5. Complete the form yourself. Do not depend upon any other party to list and value your effects adequately. In all cases check the form carefully before signing and dating is as it will form the basis of your insurance contract. As suggested above, please ensure that you read the terms and conditions on the final page of this prospectus. We would particularly draw your attention to the clauses concerning owner packed effects, jewellery, money and documents. The charge quoted by your White & Co. will be for the Super Cover, as detailed above, unless otherwise indicated. This allows cover on items listed under category P on the valuation form up to 30% of the total value of the consignment. If you require a quotation for cover with an excess or for a higher proportion of fragiles please refer to White & Co.
Once you have completed the form return it to White & Co. This will constitute your acceptance of the terms and conditions and request for insurance cover. Retain this file for your records. You will then be issued with a Certificate of Insurance. When you receive the certificate check to ensure that it has been issued correctly and advise White & Co. immediately if there are any errors. We are sure that your effects will be handled carefully. However, if you do need to submit a claim the procedure to be followed will be detailed on your certificate. In the event that your certificate is mislaid contact Removal Claims Service at the address below. Ensure that you indicate the name of your Mover, your Certificate Number, the extent of your claim and your full address. These are the terms and conditions of cover underwritten by Axa Corporate Solutions Assurance, via Basil E Fry & Co Ltd (the Broker) and your chosen Mover (the International Mover). In these Terms and Conditions, “we”, “us” and “our” means Insurers. “You” and “your” means the beneficiary of this cover. This cover shall indemnify you for all risks of loss, destruction or damage to your property, subject to the terms, conditions and exclusions contained herein. Cover under this section is effective from the time your property is professionally packed and/or uplifted from your residence, or business location of the Insured, for the commencement of the transit and continues, including incidental storage if any, until your property is professionally delivered to the specified final destination. If the goods are professionally unpacked coverage is extended to cover the period of professional unpacking provided this takes place within 7 days of delivery. Cover is extended to include temporary storage in the ordinary course of transit and terminates either on completion of unloading from the carrying vehicle, aircraft or other conveyance in or at the final warehouse or place of storage at the destination named in the contract of insurance, or on the expiry of 60 days after completion of discharge overside of the subject-matter insured from the oversea vessel, aircraft at the final port of discharge, whichever shall first occur. This may be extended subject to prior agreement by Insurers and/or their Agent. Insurers may impose special terms and conditions and/or charge an additional premium. a. Super Cover carries a nil Deductible. b. Standard Cover carries a Deductible of 1% of the total value of Customers’ Property, subject to a minimum of £25 and a maximum of £250. c. Restricted Cover provides cover following the total loss of the complete consignment or an individual carton or package as detailed on the inventory. The Insurer will pay for any loss or damage, up to the value(s) declared by you to the Mover on an Overseas Valuation Form (or substitute document), subject to the conditions and exclusions detailed herein. Insurers may, at their option, opt to repair damaged items, replace items lost or damaged beyond economical repair, or make a liquidated damages payment in settlement of any claim. Cover is provided on an indemnity value at destination basis, meaning claim settlements will be limited to the current used value of the lost or damaged property after deduction for age, wear and tear. firearms and explosive items; drugs. If your property is not made up of household goods and personal effects or office furniture and equipment, a different set of Excluded Property applies. Please refer to your Mover for details. a. Loss or damage caused by wear and tear, gradual deterioration, inherent vice or latent defect. b. Loss or damage caused by vermin, moth, insects, damp, mould, mildew, rust or atmospheric or climatic causes. c. Damage resulting from goods being moved under your express instructions against the Mover’s advice. d. Loss or damage caused by leakage of liquid from any receptacle or container. e. Any financial loss other than loss, destruction or damage to the property insured. f. Items not packed by the Mover unless they have been previously listed and disclosed to them by you. In the event of the loss of a container not packed by the Mover where the contents have not previously been listed and disclosed, Insurers will not pay more than £100 for its contents, or a lesser sum if its actual value is less. h. Electrical, electronic or mechanical derangement to any electrical, electronic or mechanical items, unless external physical damage has occurred, or as a result of fire, derailment, collision or overturning of the conveying vessel, vehicle or aircraft. Any loss of or damage to electronic equipment resulting from configuration failure of the controlling software and/or microchip. i. Structural damage to system or flat pack furniture or any reduction in its quality, arising solely as the result of dismantling or reassembly. j. Loss of or damage to motor vehicles caused by scratching, denting and marring unless a pre-shipment condition report is completed prior to removal and/or storage and/or shipment. Excluding theft of accessories, personal effects and tool kits but including loss of accessories if factory fitted. k. Loss or damage to any motor vehicle(s) whilst being driven under its own power, other than for the purpose of loading onto or unloading from the carrying conveyance or container. It is a condition precedent to liability that an Overseas Valuation Form (or substitute document) must be provided for any Certificate. In the event of loss or damage which may give rise to a claim hereunder, immediate notice, in writing, should be given to the Removal Claims Service at the address provided. Detailed notification of claim must be made within 30 days of delivery, or scheduled delivery date in the event of non-delivery, to the destination. Any claims submitted after this period has elapsed may be jeopardised, time being of the essence. If the values declared by you are less than the actual value of your property at the time of loss then you will only be entitled to recover that proportion of the loss which the value declared bears to the full value of your property. Subject to the appropriate claim settlement being reached, Insurers may at their option take over ownership of damaged property. No property may be abandoned to the Insurers. If your claim is fraudulent in any way, it will not be paid. Your cover will also be deemed to not have attached and no charges will be refunded. This insurance is governed by the law of England and Wales and is subject to the exclusive jurisdiction of the Courts of England and Wales. • Confiscation, expropriation, deprivation, destruction or damage under the order of any Government, public or local authority; War; Terrorism; Termination of Transit clause (Terrorism); Sanction Limitation and Exclusion Clause; Radioactive Contamination, Chemical, Biological, Biochemical and Electromagnetic Weapons Exclusion. Further details on these exclusions, including a full wording for each Clause, is available upon request. Please contact your Mover. • The name of the Mover with whom your original contract was made. • Estimates for repairs or replacement. • As many details as possible of your claim. Removal Claims Service is a trading name of Basil E. Fry & Company Limited.